It is soooooo cold here. I know I really have no room to complain since the temperatures here are still in the positive numbers but after living in Texas for 20 years, I have gotten used to mild winters. There have even been years when I actually had to run my air conditioning in January but not this year. This year, I have been keeping 3 blankets on my bed and wool socks near by. I had actually considered posting about a lovely avocado and citrus salad this week but it has been dark, cold, and wet outside all day today and I decided soup was much more appropriate. 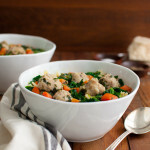 This Italian wedding soup recipe is one of my favorites but I don’t get to make it as often as I would like. I won’t lie to you – this recipe does take some time to put together. The meatballs can be time consuming and the soup takes a while to simmer. It is perfect for a lazy weekend when you are stuck indoors and want something hearty and nourishing to warm you up. Because this recipe makes so much soup, I have started making a full recipe of the meatballs but only a half recipe of the soup. I then freeze half the meatballs (uncooked) to reduce the prep time required the next time I want Italian wedding soup. This soup is always a hit with everyone I have served it to. The kids love the meatballs. I love that there are spinach and carrots in it. What’s not to love about soup? In a large bowl, combine the bread, milk, egg, and salt. Stir until everything is well moistened. Allow to sit for about 10 minutes to soften. Add the ground turkey, onion, cheese, garlic powder and dried parsley. Mix gently until thoroughly combined. Shape small meatballs (about 1 inch in diameter or less), using a teaspoon measuring spoon to make the meatballs. I use a small measuring scoop to get even sized meatballs. If the meat mixture sticks to your hands too much, moisten hands slightly with water. Place the meatballs on a parchment-lined or lightly greased cookie sheet, and refrigerate them while you prepare the soup. Heat the olive oil in a very large (at least 6-quart) pot over medium heat. Add the onions and carrots. Sauté, stirring frequently, until the onions are translucent and beginning to brown, about 10 minutes. Add the garlic and cook until fragrant, about 1-2 minutes. Add the broth, oregano, and basil. Bring to a simmer, and cook gently for 10 minutes. Add the partially thawed chopped spinach, and bring the soup back to a simmer, breaking up any clumps of frozen spinach. Gently drop the meatballs into the soup. Simmer the soup for 30 minutes or so, then stir in the orzo pasta. Continue to simmer until pasta is al dente, about 8 minutes. Serve the soup garnished with freshly grated Parmesan or Asiago cheese, if desired. This makes a really thick soup. Use more chicken broth if you want a thinner soup.